ALFA ROMEO ALFETTA 1973-1987 WORKSHOP REPAIR & SERVICE MANUAL #❶ QUALITY! This professional technical manual contains service, maintenance, and troubleshooting information for your ALFA ROMEO ALFETTA 1973-1987, covering All Models/Engines/Trim/Transmissions Types. This top quality service manual is COMPLETE and INTACT as should be without any MISSING/CORRUPT part or pages. It is the SAME manual used in the local service/repair shop. Our cost-effective manuals are guaranteed to be fully funtional to save your precious time. 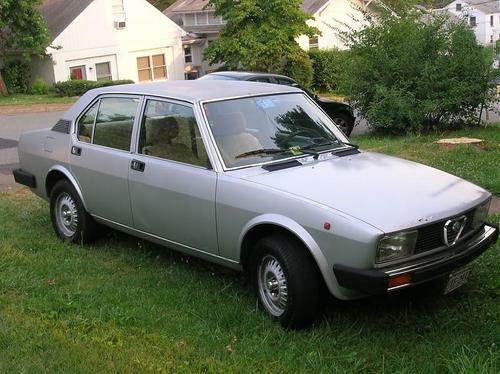 This manual for ALFA ROMEO ALFETTA 1973-1987 is divided into different sections. Each section covers a specific component or system and, in addition to the standard service procedures, includes disassembling, inspecting, and assembling instructions. A table of contents is placed at the beginning of each section. Pages are easily found by category, and each page is expandable for great detail. Listed below it's the main categories that can be found in our manuals. You will expect even more sub categories in this manual for ALFA ROMEO ALFETTA 1973 1974 1975 1976 1977 1978 1979 1980 1981 1982 1983 1984 1985 1986 1987. Buy Now! Download immediatly! All our Data discs are Easy-To-Install, Readable & Printable. Our discs are fully compatible with PC & MAC Operating systems (including Windows 8) and there are no annoying activation codes, encryptions, or passwords. This is the ideal product to add to your collection, specifically designed for Garage owners, Service repairers, MOT testers, Parts advisers, Collectors, Enthusiasts etc. Included on this disc are problematic technical solutions, information that includes; Fault code diagnostics, Specific torque settings, Re-setting of service light indicators, Fluid levels & grades, Service intervals, General vehicle maintenance & mechanical information plus much much more. We provide various Repair Manual, Service manual, Workshop Manual, for Cars, Trucks, Industrial Equipment, Heavy Equipment ...etc. All in a pdf and software from various kinds of brand cars and motorcycles. All major topics are covered complete step-by-step instruction, diagrams, illustration, and specifications to repair and troubleshoot. With this manual on hand, you will have 100 confident to do a repairing and services with your own. This workshop service / repair manual for ALFA ROMEO ALFETTA 1973-1987 can easily help you with any repairs that you may need to do. Many people are scared to touch their cars because it seems difficult. This is only true when you do not have the resources and tools available for when that time comes! Perfect for the DIY person. This file is sold by gawk, an independent seller on Tradebit.